Red Dead Online is recently launched multiplayer beta spinoff of the Red Dead Redemption 2 story. Red Dead Online differs in features and mechanics to the main game, including the hunting of animals and selling their pelts. In general, hunting animal and selling their fur is not as important in Red Dead Online. In the Red Dead Redemption 2 single player, hunting, skinning, and selling animals pelts is an easy way to make money. Animal pelts can also be used to create useful items, including warmer clothes and stronger satchels. 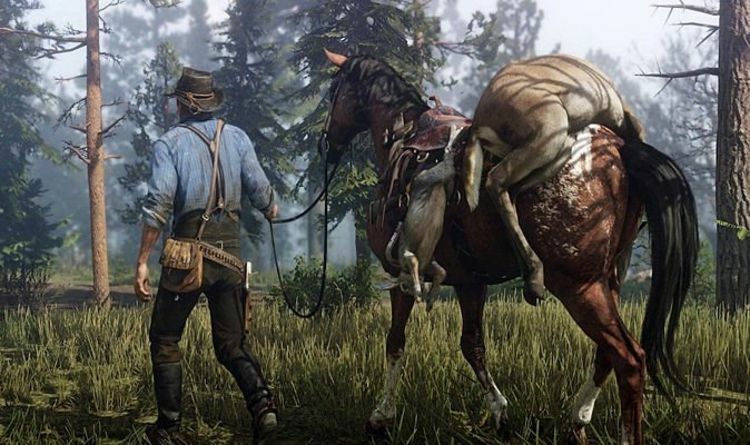 However, pelts’ importance is reduced in Red Dead Online, because players are unable to craft new items. Additionally, trappers – where players sell animal pelts – are missing from Red Dead Online. Red Dead Online players now need only to take their collected animal pelts to the local butchers. Butchers are found in the bigger towns spread around the enormous Red Dead Redemption 2 world map. News that hunting animals is not as important in Red Dead Online may disappoint some players, but there is still much to do. Players can form posses of up to seven in size, and then take on a variety of story missions and free-roaming activities together. Red Dead Online also allows gamers to team up together and take part in various multiplayer matches. The most popular of these is the Red Dead Online Make It Count battle royale mode. READ MORE: Red Dead Redemption 2: How to play on a private server? Make It Count battle royale finds players armed either with bows and arrows or throwing knives. The Make It Count battle royales are small compared with others games, seeing groups of either 16 or 32 players fighting it out. Characters are killed with just one shot, and players cannot pick up better equipment. This puts every player on an even playing field. At the time of writing, Make It Count takes place on one of three maps: Tall Trees, Strawberry and Stillwater Creek. Read Dead Online developer Rockstar will reportedly add more locations to the battle royale mode. The playable area of these maps continually shrinks as the blood bath rages, which is standard for the genre. This edges players closer together, making deadly confrontation increasingly likely. Like others in the genre, Make It Count offers a spectator mode after you are dispatched from the match.